It surprises no one that the charming but wayward Vadinho dos Guimaraes–a gambler notorious for never winning—dies during Carnival. 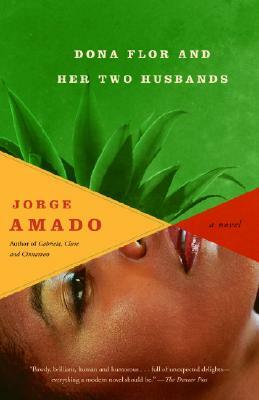 His long suffering widow Dona Flor devotes herself to her cooking school and her friends, who urge her to remarry. She is soon drawn to a kind pharmacist who is everything Vadinho was not, and is altogether happy to marry him. But after her wedding she finds herself dreaming about her first husband’s amorous attentions; and one evening Vadinho himself appears by her bed, as lusty as ever, to claim his marital rights. Jorge Amado—novelist, journalist, lawyer—was born in 1912, the son of a cacao planter, in Ilheus, south of Salvador, the provincial capital of Gabriela, Clove and Cinnamon. His first novel, Cacao, was published when he was nineteen. It was an impassioned plea for social justice for the workers on Bahian cacao plantations; and his novels of the thirties and forties would continue to dramatize class struggle. Not until the 1950s did he write his great literary comic novels—Gabriela, Clove and Cinnamon, and Dona Flor and her Two Husbands—which take aim at the full spectrum of society even as they pay ebullient tribute to the region of his birth. One of the most reknowned writers of the Latin American boom of the sixties, Amado has been translated into more than 35 languages. A highly successful film version of Dona Flor was produced in Brazil in 1976. He died in 2001.